This is probably the best example to say less is more. The most simple design and very clean and not busy at all. 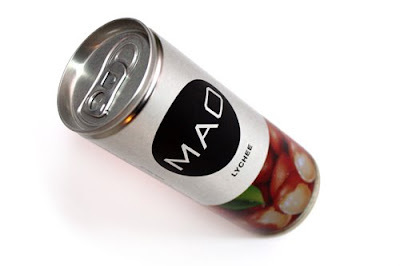 This can is produced in Austria by Mao holding. For what I see this designs target market are higher class people with more exquisite taste for beverages. The design is just perfect and looks good for a new product, they sure got the correct designer in the company. Only thing is that they should done something about the circle, because it is not round and look more oval. However the this is not the best tasting lychee beverage, however it is a good refreshing taste but not the best. It should be much sweeter and I am not all into the mix of lemon and lychee, I can actually define the taste of lemon in it and actually should be called Lemon Lychee then just Lychee. However I think the drink could be more fitted for the ladies though and not really aimed for most men and children. However on their website I saw they have more kinds of special taste like pomelo and pineapple. The can is very odd it is much harder then normal 25cl cans. You can't squeez it flat when you have drank it empty. They have choosen a very thic aluminum, also it is differently contructed then the normal 25cl cans. It looks very much ike a normal paint can like material and how it is put together. So the can might be most expensive part. Think they only need to look at a better can producer like Ball Packaging for a more normal can.